Johnny McKinstry is on a mission. The 29-year-old Northern Irishman is less than a month into his reign as Rwanda boss and is exuding the optimism you would expect of with a high-achieving young man. He proclaimed himself "satisfied" by what he saw in his first match in charge, despite the 29 March friendly in Zambia ending in a 2-0 defeat for his side. And he is confident he can shape the team into one capable of mounting a serious challenge for the 2016 African Nations Championship, which will be played in Rwanda, as well as qualifying the team for the 2017 Africa Cup finals. "Naturally, everyone is disappointed with the result against Zambia but there a lot of positives. We started with six players who are under 20 so for me the future is bright for Rwandan football," McKinstry told BBC Sport. "First of all, the players are very very committed and hardworking. I don't think I will ever find a player in that group who would not give me absolutely everything for 90 minutes. "We have some very good players . The foundations are there - it's a very young team and it's a very exciting time to be involved with such an exciting group of players." Mckinstry is eager to make his mark with Rwanda having not quite lived up to his hopes in his previous role as Sierra Leone boss. 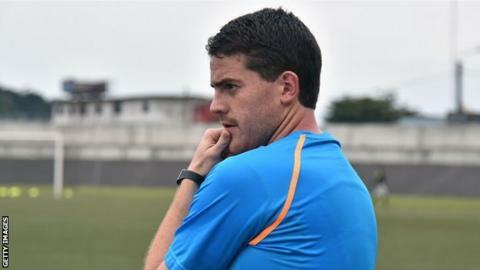 After being appointed by the Leone Stars at the age of 27, McKinstry was sacked only six months after he had been given the job on a permanent basis. However, the abrupt ending does not seem to have dented his belief and he is prepared for the next test. "What attracted me is the challenge. With Rwanda, I knew that they had come up in the world rankings from the 130s up to the 60s and 70s in the last year and a half," he said. "So it showed me that their football is moving in the right direction. "Also with Rwanda hosting the CHAN tournament next January, it will be an opportunity not only to showcase football but the country in general to a wide audience around the globe." And he insists he is thriving on the pressure to deliver. "These are the risks we have to take in life if we want to achieve success," he said. "I have never been a shrinking violet, one who shies away from a challenge or a hard task. For me, the only way we can succeed is to take challenges head on."